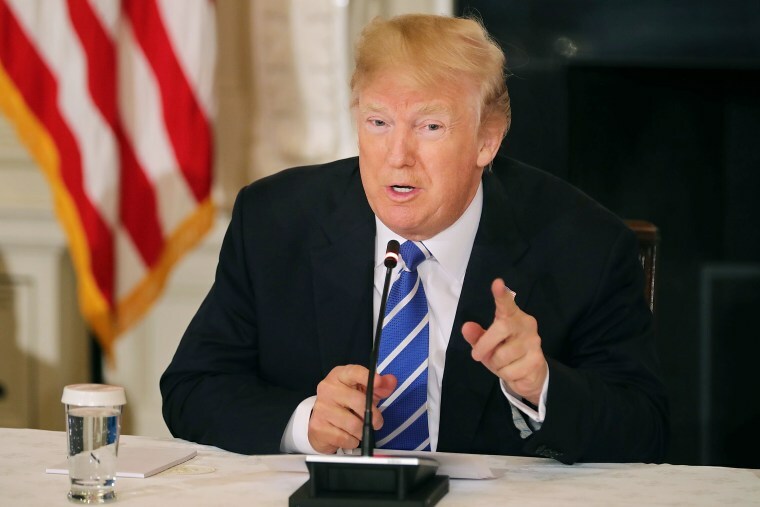 WASHINGTON — President Donald Trump spoke out against domestic violence on Wednesday, a week after Rob Porter resigned as White House staff secretary over allegations that he abused his two ex-wives. "I am totally opposed to domestic violence and everybody here knows that," Trump told reporters during a meeting about opportunities from tax reform. "I am totally opposed to domestic violence of any kind. Everyone knows that and it almost wouldn't even have to be said. So now you hear it, but you all know it." The short response to questions from reporters made no mention of Porter's ex-wives, who have publicly alleged that Porter physically and emotionally abused them during their marriages. Trump has ignored questions about the Porter scandal several times this week, though his press secretary did read a statement on Monday that she said came directly from him. "The president and the entire administration take domestic violence very seriously, and believe all investigations need to be investigated thoroughly," said the press secretary, Sarah Huckabee Sanders. "Above all the president supports victims of domestic violence and believes everyone should be treated fairly and with due process." Asked why the president himself had not personally stated — or tweeted — those sentiments, Sanders responded that "those are actually his direct words that he gave me earlier today." Last week, Trump wished Porter well in the immediate aftermath of his resignation. "He did a very good job when he was in the White House," Trump said at the time, calling it a "very tough time for him" in the wake of these allegations. Over the weekend, Trump lamented that "mere allegations" could shatter and destroy the lives of the accused. He made no mention of Porter in his tweet, but questioned: "Is there no such thing any longer as Due Process?" Sanders' statements this week have hinged heavily on broad support for victims of domestic violence, but stressed the importance of due process. She has also responded ambiguously to questions about if Trump himself believes the allegations made by Porter's former wives. While Trump, Sanders said, "takes all of these accusations very seriously," he "believes in due process," she said Tuesday. "Above everything else, he supports the victims of any type of violence, and certainly would condemn any violence against anyone."